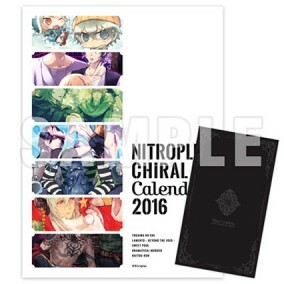 Set includes Nitro+CHiRAL 2016 calendar and day planner! Nitro+CHiRAL 2016 Calendar and the Nitro+CHiRAL Day Planner set, encompassing the history of Nitro+CHiRAL. Calendar features seven all-new illustrations by Yupon, Piyoko Hatori, Eiji Kaneda, Seiji Onitsuka, Honyalala, Uiro Yamada, and Hanaharu Naruko! And you can use it until March 2017. Day planner designed with practicality in mind, giving equal importance to form and function. Spend 2016 together with Nitro+CHiRAL.